^ A. アンドレァデス 『イングランド銀行史』 日本評論社 1971年 pp.92-94. ^ a b c d e f Alexander A. Vasiliev (1958). 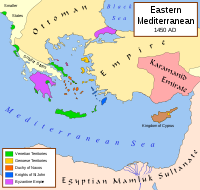 History of the Byzantine Empire, 324-1453. University of Wisconsin Press. p. 537-38. ISBN 0299809269. ^ a b c d e William Miller (2009). The Latin Orient. Bibliobazaar LLC. p. 51-54. ISBN 111086390X. ^ Thomas Allison Kirk (2005). Genoa and the sea: policy and power in an early modern maritime republic, 1559-1684. JHU Press. p. 188. ISBN 0801880831. ^ J. F. Fuller. A Military History of the Western World, Volume I date=1987 publisher=Da Capo Press. p. 408. ISBN 0306803046. ^ Joseph F. O'Callaghan (2004). Reconquest and crusade in medieval Spain. University of Pennsylvania Press. p. 35. ISBN 0812218892. ^ a b c d e Steven A. Epstein (2002). 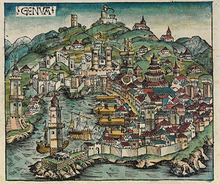 Genoa and the Genoese, 958-1528. UNC Press. p. 28-32. ISBN 0807849928. ^ Robert H. Bates (1998). Analytic Narratives. Princeton University Press. p. 27. ISBN 0691001294. ^ a b c William Ledyard Rodgers (1967). Naval warfare under oars, 4th to 16th centuries: a study of strategy, tactics and ship design. Naval Institute Press. p. 132-34. ISBN 087021487X. ^ Frederic C. Lane, Venice. A Maritime Republic, Baltimore－London, 1973, pp.189-196. ^ Philip P. Argenti, Chius Vincta or the Occupation of Chios by the Turks (1566) and Their Administration of the Island (1566-1912), Described in Contemporary Diplomatic Reports and Official Dispatches (Cambridge, 1941), Part I. ^ Outlined in Manlio Calegari, La società patria delle arti e manifatture: Iniziativa imprenditoriale e rinnovamento tecnologico nel reformismo genovese del Settecento (Florence, 1969).